ClusterControl makes it easy to deploy a database setup - just fill in some values (database vendor, database data directory, password and hostnames) in the deployment wizard and you’re good to go. The rest of the configuration options will be automatically determined (and calculated) based on the host specifications (CPU cores, memory, IP address etc) and applied to the template file that comes with ClusterControl. In this blog post, we are going to look into how ClusterControl uses default template files and how users can customize them to their needs. config.ini.mc MySQL Cluster configuration file. haproxy.cfg HAProxy configuration template for Galera Cluster. haproxy_rw_split.cfg HAProxy configuration template for read-write splitting. garbd.cnf Galera arbitrator daemon (garbd) configuration file. keepalived-1.2.7.conf Legacy keepalived configuration file (pre 1.2.7). This is deprecated. mongodb-2.6.conf.org MongoDB 2.x configuration template. mongodb.conf.org MongoDB 3.x configuration template. mongodb.conf.percona MongoDB 3.x configuration template for Percona Server for MongoDB. mongos.conf.org Mongo router (mongos) configuration template. my.cnf.galera MySQL configuration template for Galera Cluster. my57.cnf.galera MySQL configuration template for Galera Cluster on MySQL 5.7.
my.cnf.grouprepl MySQL configuration template for MySQL Group Replication. my.cnf.gtid_replication MySQL configuration template for MySQL Replication with GTID. my.cnf.mysqlcluster MySQL configuration template for MySQL Cluster. my.cnf.pxc55 MySQL configuration template for Percona XtraDB Cluster v5.5. my.cnf.repl57 MySQL configuration template for MySQL Replication v5.7. 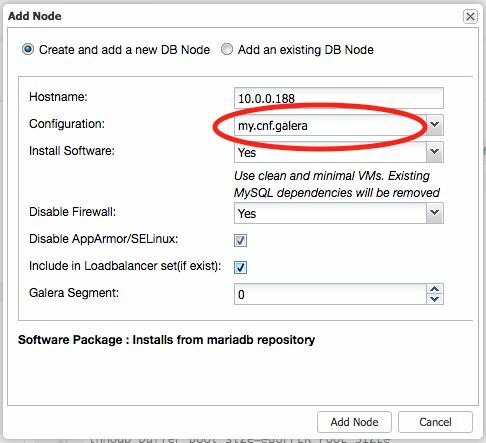 my.cnf.replication MySQL configuration template for MySQL/MariaDB without MySQL’s GTID. mysqlchk.galera MySQL health check script template for Galera Cluster. mysqlchk.mysql MySQL health check script template for MySQL Replication. mysqlchk_xinetd Xinetd configuration template for MySQL health check. mysqld.service.override Systemd unit file template for MySQL service. The above list depends upon the feature set provided by the installed ClusterControl release. In an older version, you might not find some of them. You can modify these template files directly, although we do not recommend it as explained in the next sections. 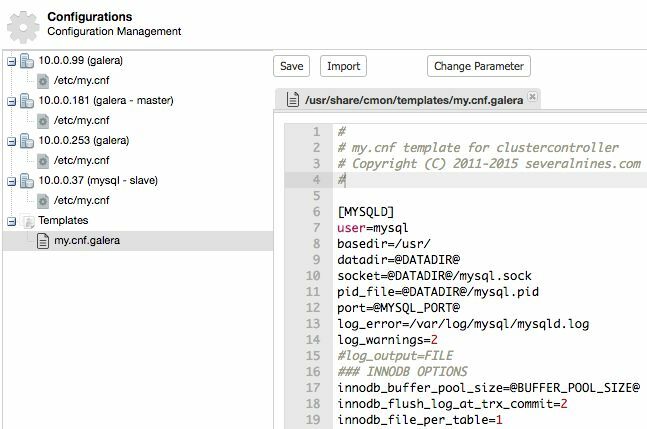 ClusterControl will load the base template content of Galera configuration template from /usr/share/cmon/templates/my.cnf.galera into CMON database (inside cluster_configuration_templates table) after deployment succeeds. You can then customize your own configuration file directly in the ClusterControl UI. Whenever you hit the Save button, the new version of configuration template will be stored inside CMON database, without overwriting the base template file. If the dynamic variable is replaced with a value (or undefined), ClusterControl will skip it and use the configured value instead. This is handy for advanced users, where usually have their own set of configuration options that tailored for specific database workloads. Click on Deploy button to start the database cluster deployment. After the database cluster deployment completes, you might have done some fine tuning on the running servers before deciding to scale it up. When scaling up, ClusterControl will use the configuration template inside CMON database (the one populated under ClusterControl -> Configurations -> Templates) to deploy the new nodes. Hence do remember to apply the modification you made on the database server to the template file. Then, click on “Add Node” button to start the deployment. That’s it. 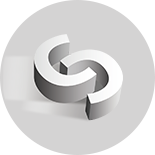 Even though ClusterControl does various automation jobs when it comes to deployment, it still provides freedom for users to customize the deployment accordingly. Happy clustering!